LIMASSOL, Cyprus, Feb. 7, 2019 /PRNewswire/ -- Naviaddress, the company which develops, markets and operates an address platform, has launched a functionality to link a Premium Naviaddress ID on Ethereum blockchain to a particular naviaddress data stored in the off-chain. The release of the function "to bridge on and off-chain" is an important milestone of the roadmap in building the leading location ID management platform to operate the storage and usage of unified digital IDs and establish the standard in human-machine interaction. Implementing user-friendly digital location identity contributes to the mass adoption of blockchain-based products and services for the benefits of common people in daily life. "Naviaddress gives an opportunity to transform a language-specific address and place description into digitized and searchable information. It comprises several layers – a geo-specific content database, three proprietary applications for users to create, share and search users' naviaddresses, and a decentralized blockchain application which allows interaction with public Ethereum networks to buy and sell Naviaddress IDs. With an aim to set a new standard in digital addressing for a digital transformation, we will continue further dialog with State Postal Services and large addresses holding businesses including express delivery and e-commerce industries," - said Dmitry Moiseev, co-founder of Naviaddress Platform. Naviaddress patented technology covers the use of numeric identifiers for locating objects and navigating in spatial maps. The Soft Launch of Premium Naviaddress Auction took place at the beginning of September, 2018 and was limited to 26 countries, where the early-adopters made test purchases of Premium Naviaddresses on Ethereum public blockchain. 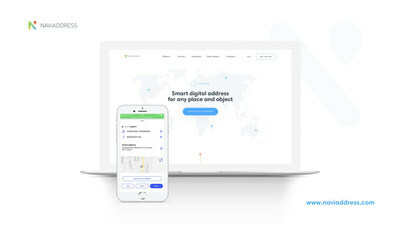 Premium Naviaddresses are currently available for sales at https://premium.naviaddress.com/. The Naviaddress solution was recognized as one of the "Top 10 Blockchain Solution Providers 2019" in the annual listing of CIO Applications Europe magazine, a business and technology print magazine with a unique peer-to-peer approach, where the industry leaders share their wisdom with similar experiences, specifically for the European region. Naviaddress is a blockchain ID management platform which develops, markets and operates a global universal addressing system for any places or objects. The current system is being deployed onto the blockchain. It will provide people and businesses with a new opportunity to create, obtain, own, share, lend smart digital addresses as well as register, own and sell them on the blockchain. The company was founded in 2015 in Cyprus. Currently the team members are working in Cyprus, Russia, Germany and Canada. The company actively works on implementing new international addressing standards which are relevant to the modern digital world. For more information, please, go to the website naviaddress.com. At Naviaddress, we will continue to focus on transforming the conventional addressing system. We are selectively choosing regional partners who are ready to develop a common business plan and cooperate in a team environment. For more details about cooperation, please, send us a request to feedback@naviaddress.com.